One of the most useful things I've built is a portable battery charger. Basically a car alternator driven by a small petrol motor, its great for charging a flat battery quickly. 1. Flat battery in the car. Or a car that's hard to start after some repairs. The portable charger can re-charge a car battery in a few minutes. 2. Power Failure. I have an inverter to power a few appliances from my small battery bank, but I don't have a lot of battery capacity, so the portable charger can keep the batteries topped up. You can use just about any small petrol, or if you can find one, diesel motor for a portable charger. 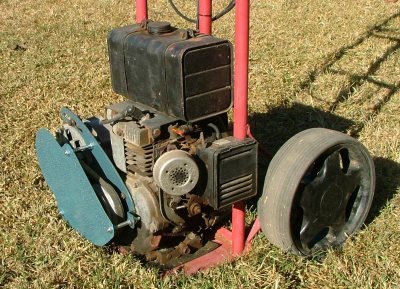 Lawn mower motors are a good choice, 4 stroke is preferred, though 2 stroke can work. 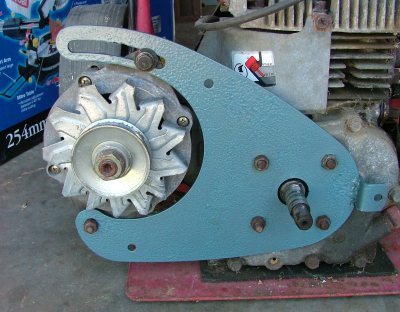 If you took the cutting plate off, and now find the motor hard to start, you will need to add a flywheel. 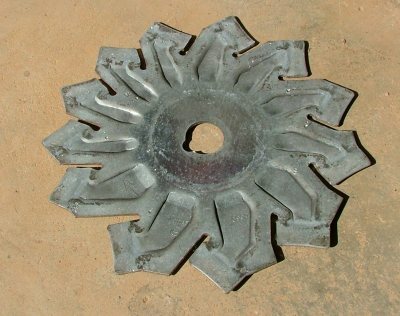 A large steel pulley will work. 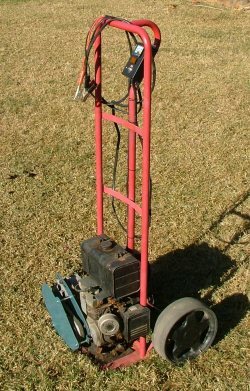 Weed Eater or Whipper Snipper motors? Forget it, your going to need at least 4 or more horse power to drive a alternator at full power. This is my first build of the portable charger. 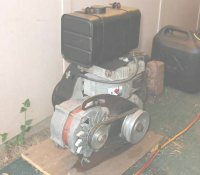 The motor is a Kubota 5.2hp 200cc 4 stroke I bought off ebay a few years back. The alternator is a 75amp 12v Bosch with internal regulator. 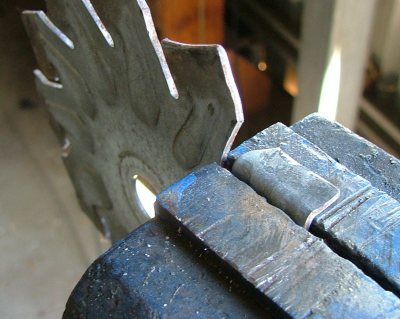 At the time I had access to a laser cutter, so I lasercut the adapter plate from 3mm mild steel. It worked pretty good, but wasn't very portable. Since then I've mounted the charger to a old trolley, see the photo above. Now its portable.The wheels are from an golf buggy. After building the charger I discovered the motor runs in the opposite direction to the direction the alternator was designed to run. I should have mounted the alternator out the front of the motor, facing the other way, but too late now, and besides I like the compact layout. 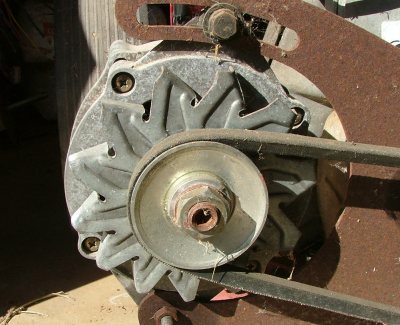 The only problem with running a alternator backward is the cooling fan wont work as good as the alternator needs it to. If you only intend to use the charger for a few minutes, on light loads, you can get away with it. But if you want a bit more reliability, then you need to reverse the fan. This is the factory fan. Its designed to run clockwise looking at the front, but I've got it running anticlockwise. So I took the fan off and belted it flat with a hammer. 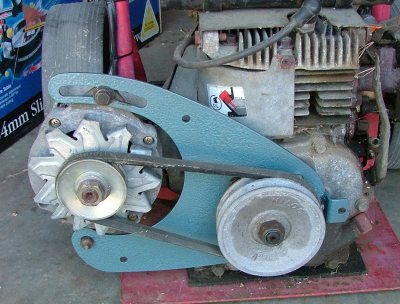 To take the fan off you'll need a rattle gun, or rip the whole alternator apart and grab the armature in a vice, that front nut is tight! 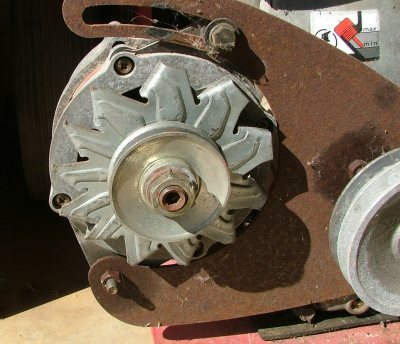 If you do pull the alternator apart, be careful when you put it back together not to break the brushes. Then with the help of a vise and hammer I bent the fins the other way. Its pretty easy, except for the last fin, a bit fiddly. And back on the alternator. Its now OK to run anti-clockwise. While I was at it, I decided to give the rusty old adapter plate a clean up and paint. All back together with belt fitted. I also added a guard to stop little fingers and dog noses loosing skin on the belt or fan.